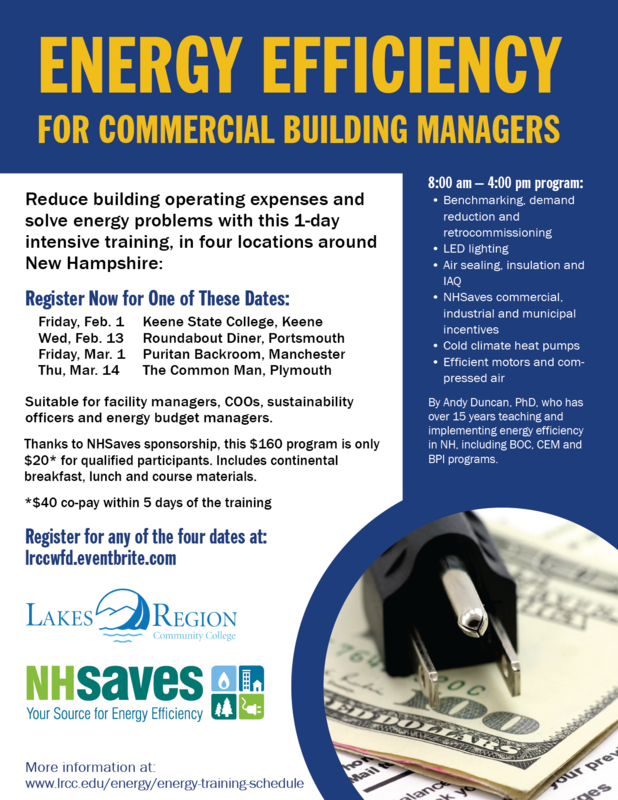 Reduce building operating expenses and solve energy problems with this 1-day “Energy Efficiency for Commercial Building Managers” intensive training sponsored by NHSaves. The same program will be in three more locations around New Hampshire- Portsmouth 2/13, Manchester 3/1 and Plymouth 3/14. Topics range from LED lighting, cold climate heat pumps, air sealing, efficient motors, retrocommissioning and more. For facilities and energy managers who are C&I customers of NHSaves utilities. This intensive training highlights key points from Lakes Region Community College’s popular multi-day energy efficiency trainings. Registration required and discounted $20 co-pay for advance reservations for this program valued at $160. Includes continental breakfast, lunch and course materials. Go to lrccwfd.eventbrite.com for more information and registration.